If you have seen my last few posts and visits to the Northern Territory (here and here), you will know that it is absolutely one of my favourite destinations in the world. 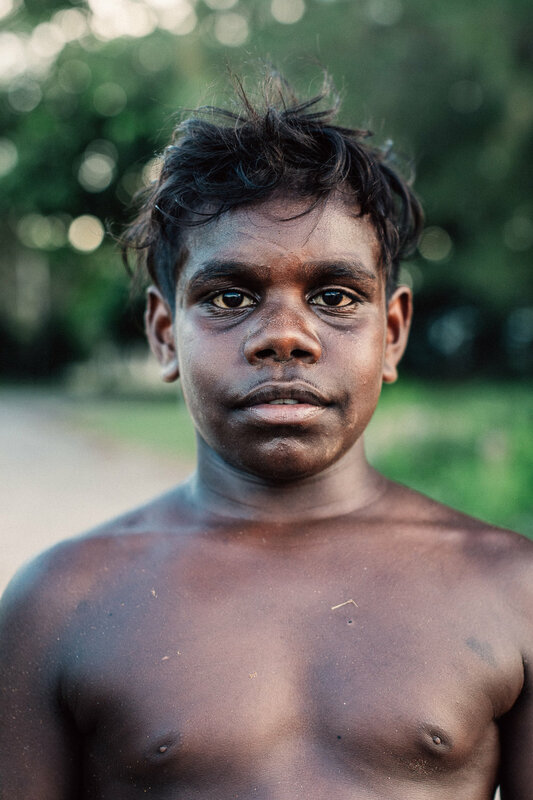 I feel truly lucky that Australia is the country I come from and I am really passionate about capturing it’s true essence and paying respects to the traditional land owners by sharing the beauty of this rich, incredible place with you. Honestly, there is no other place I’ve seen that is as unique or as diverse as the Northern Territory. I encourage you to go as soon as you can -- take off your shoes, turn off your phones and feel the land alive around you because this is a place of magic and the connection to land and traditions are still very much alive. 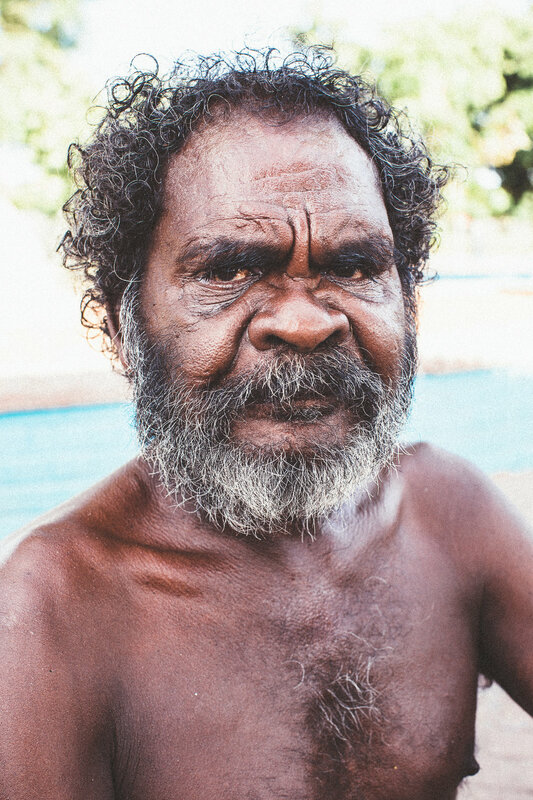 You can sit under the stars as you listen to the Spiritual Ancestors and Dreamtime Creation stories and be apart of experiencing one of the oldest and most beautiful living cultures in the world. Our journey began in Darwin, arriving late afternoon we set off to find a location to either photograph the sunset or (with high hopes) witness an epic tropical Top End storm. This is where I first noticed Zion and his brother Meshach, as they were running around on the sand and back flipping off the rocks. I yelled out and told them how cool it looked and for the rest of the afternoon that was it – we became friends and played like children. As we ran down the beach together the group multiplied and we were joined by Jamie-lee, Samariah and Maxwell who were all really excited as I pulled my drone out and they saw one for the first time. The next morning we set off for our mini road-trip heading for Kakadu National Park, a place I had visited a few years ago and fallen in-love with. The landscapes undergo dramatic changes throughout the six different seasons of the year, which are recognized by the traditional landowners the Bininj/ Mungguy people and I’d been looking forward to seeing it in a different light. A knowledge of nature is fundamental to the culture of the people who have lived, adapted and relied on this unique and ever-changing landscape for tens of thousands of years and Gudjewg (Monsoon Season) sees an explosion of green, generating an exceptionally beautiful and unique biodiversity. Oh, was it breathtaking! With a variety of landforms, habitats and wildlife there is so much to take in with each visit to the Northern Territory and this is something that keeps drawing me back (I’m on my sixth visit and counting). 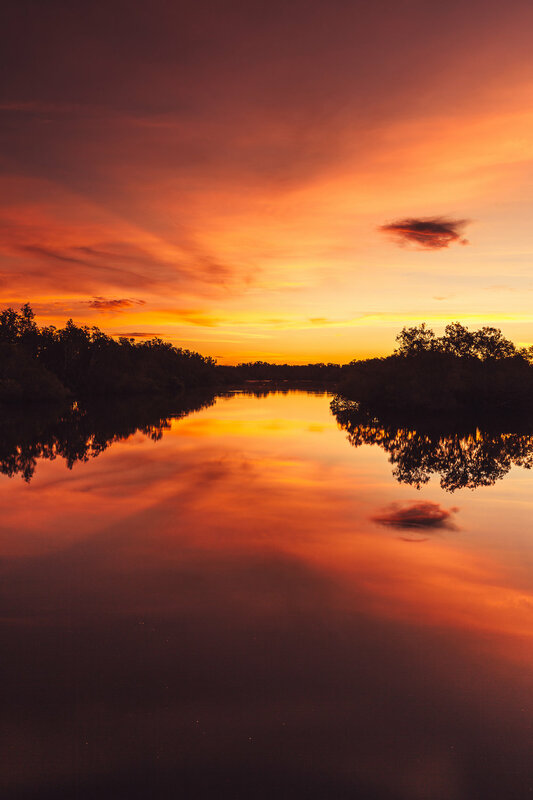 Kakadu National Park is home to almost one-fifth of Australia’s mammals, and provides a habit for over one-third of Australia’s birds, with the wetlands being an internationally important staging point for migratory birds. Some of these birds are found nowhere else in the world and after just a short stroll down a boardwalk and onto a viewing platform you are immersed in a sanctuary of abundant wildlife. Of the twenty species of crocodilians in the world, two species are found in Australia and in Kakadu – the freshwater and estuarine (saltwater) crocodile. With Yellow River Cruises (link) you can meander through the flood plains amongst Paperbark, Pandanus and Fresh Water Mangroves. A sunrise or sunset cruise will have you face to face with the world’s largest living and most ancient reptile in it’s natural habitat. Crocodiles have remained unchanged for nearly 200 million years, and it is absolutely captivating to be up close and personal with these interesting, pre-historic creatures and to learn all about them from the passionate locals and tourism operators who have been protecting them since the hunting ban in 1971. A ‘must do’ and extremely powerful experience is taking a bush walk to view the rock art of the Creation Ancestors in Kakadu - at either Ubirr or Nourlangie (Burrungkuy) - where the outdoor galleries show one of the longest historical records of any group of people in the world. Some of the sites are considered sacred or dangerous and out of respect you may not photograph them, however it is a true honour to be able to physically be in the presence of something created 60, 000 years ago and to stand present, truly respect and only take memories away with you. I still get goose bumps thinking about it. At the end of the many bushwalking tracks accessible in wet season you will find a hidden oasis awaiting your arrival. In the Mary River region along the Yurmikmik walks we found a secluded natural pool known as Motor Car Falls. After what was a 7.5km return trip in the midday sun , spending a refreshing few hours here swimming under the waterfall with the entire outdoor playground to ourselves was definitely worth it. The evening to follow was spent laying down on the extremely hot rocks at Nawurlandja Lookout and waiting for the storm to roll through the expansive, world-class view across the Anbangbang Billabong to Burrungkuy (Nourlangie Rock) and the Arnhem Land escarpment. I had photographed the scene and put my camera away (in anticipation of being rained on) lay down to breathe and listen to the land. Taking in the scenery and the energy of the dramatic storm rolling through on this tropical summer evening - everything around me felt ALIVE. Our next stop was Jabiru region, where we took to the sky for an unforgettable scenic helicopter flight. Flying over the escarpment of Kakadu I hung literally half out the helicopter window in complete silence. Time seemed to stand still and all the noise faded away. As we hovered I could see the endless grand scale covering nearly 20,00 square meters of national park. As we flew over terrain encompassing wetlands, rivers and sandstone escarpments I was mesmerized by all the layers, completely lost in thoughts about the history of this precious land and marveling at the fact that what once was a sea is now this impressive raw, multi-coloured exposed rock and endless canopy of green. I begun thinking about the aboriginal people who had walked on this strikingly beautiful earth before me and about how their survival relied on their deep spiritual connection to the land and incredible knowledge of the environment and it’s ecology. I felt really overwhelmed as we lead up to what I consider the grand finale, hovering over the dramatic Jim Jim Falls and witnessing a full summer flow. Feeling the energy coming off the magnificent waterfall made this visit to the Top End an experience I’ll never forget. After all the excitement, we finished off our journey at the ever-relaxing Wildman Wilderness Lodge (link), a small-scale, high quality safari lodge that offers the ultimate bush luxury experience. Here you can observe nature at it’s best, gliding down the river to the home billabong, sighting more crocodiles and viewing the abundant birdlife and scenery of the region was incredible. I slowly rose on our final morning to the chorus of birds and indulged in the comfort of good food and even better company. During Wet season ( months ) the Top End is a mystery to most, but it is absolute magic. 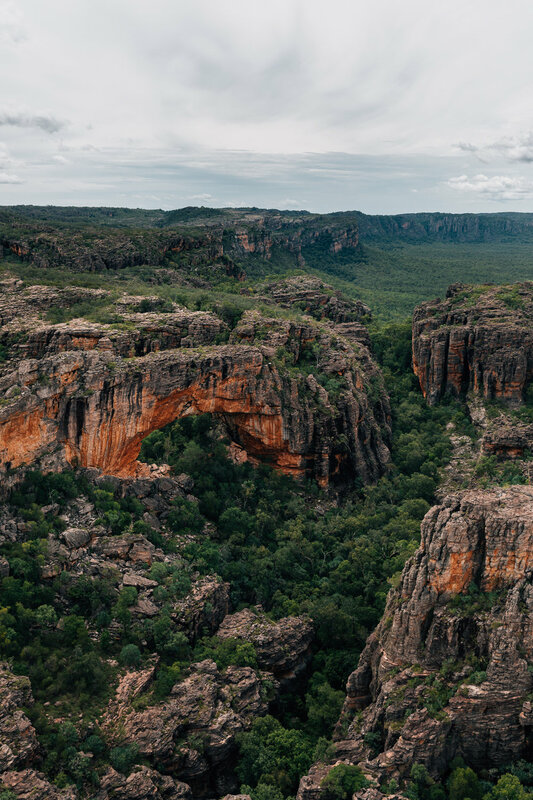 Kakadu’s timeless landscape will take your breath away, from winding rivers to sunburnt escarpments and stunning waterfalls. I gained an even deeper appreciation for this wondrous place and I’m sure once you visit you’ll be left wanting to see , hear and do more. As always, thank you for having me NT, you hold a truly special place in my heart. Thank you to my bestie, travel buddy and absolute inspiration @jarradseng and as always @hm_weir for the memories, roadtrip sing-a-longs, deep conversation and fits of laughter. Please see Jarrad’s little BTS video here.